BMW M5 Performance, Engine, Ride, Handling | What Car? One thing you quickly learn about the M5 is that it is so configurable, with settings for everything, that you can’t learn it quickly. 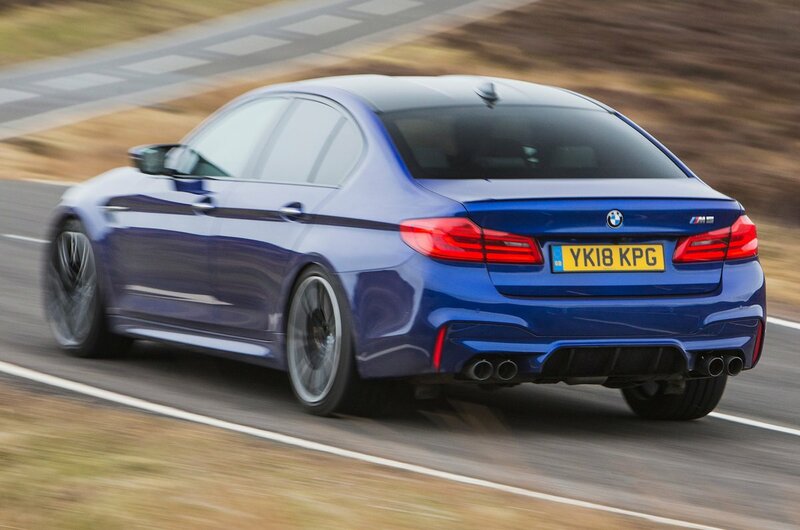 However, as a general rule, if you keep the standard adaptive dampers in their softest setting and select Efficient mode via the Drive Performance button - for tamer accelerator response and less aggressive gearchanges, etc - the M5 bumbles around in a more relaxed fashion than the always more aggressive-feeling Mercedes-AMG E63. Its turbocharged V8 remains hushed and biddable, and the eight-speed automatic gearbox shuffles neatly through its gears. Although there is some pitter-patter from the suspension over really battered town roads, considering the enormity of those tyres at each corner (demanded by the spectacular muscle this car has), it’s barely much of a compromise over a standard 5 Series. So, it’s comfortable and easy to drive when you want it to be: tick. 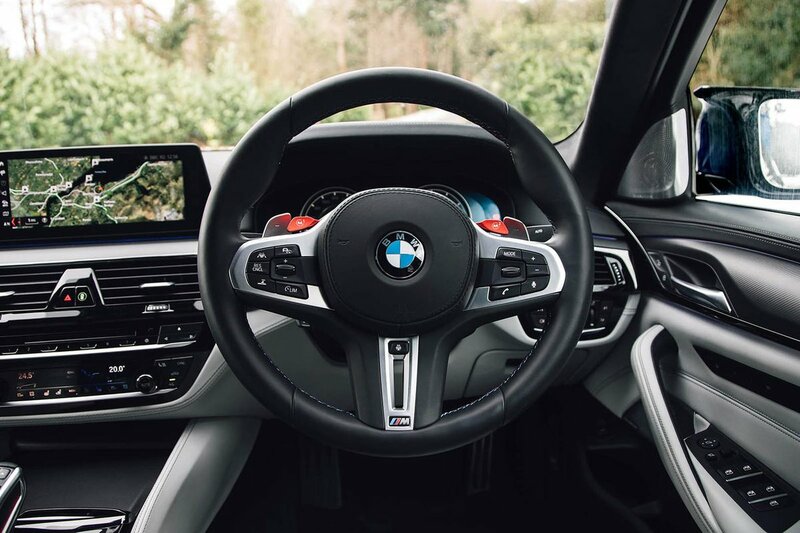 Switch to the other extreme, however, by ramping up the drive system to its most extreme Sport+ mode and the M5 demonstrates the distinctive duality that buyers of previous M5s have grown to love. Okay, even in its most aggressive mode the gearbox doesn’t have the instantaneous responses of the Porsche Panamera Turbo’s ’box, but for a turbocharged engine the accelerator response is virtually instantaneous – and then comes the power. And what power: it fires you up the road like the angry hand of God has just given you an almighty smack on the bottom. It gets a big tick for that. And, despite weighing close to two tonnes, BMW has done an impressive job of concealing all that mass. The M5 determinedly resists lean through faster corners and stays superbly composed over even quite challengingly uneven roads. That’s one more tick, then. Then there’s the four-wheel drive system. Thanks to this, you can deploy all 591 horses at any speed and in any gear with virtually no drama – beyond that of the rapidly rising speedometer on your licence – because traction out of corners in stupefying. In fact, it feels more like a grand tourer than a performance saloon in the way it effortlessly dispatches many miles in the blink of an eye on any road. In a word, it’s rapid – so that is another tick. Yet it does all feel rather too easy; a bit too digital. Even the V8 engine sound is partly synthesised noise pumped through the speakers, so from a purist’s point of view is it a damp squib compared with the bonkers and shouty E63? Well, no. If you switch the stability control to its midway point (called MDM mode), the rear-biased four-wheel drive system really lets you have some fun; get it on track and it will slip into tail-out oversteer like the great M5s of old. And of course, if you’re a true adrenalin junkie, you can always take the nuclear option and switch off four-wheel drive completely to make the M5 rear drive only. Mind you, because this also completely disables the traction and stability controls to leave your skills ruthlessly exposed, this option is certainly best left for a closed circuit. But what if even that’s not exciting enough for you? 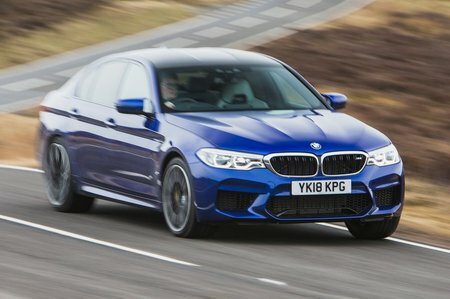 Well, BMW also offers a more focused variant of the M5 called the Competition, which has been designed with the sole aim of getting your blood pumping. It gets an extra 25bhp from its brawny 4.4-litre V8, a 7mm drop in ride height, tweaked dampers, stiffer springs and a modified rear anti roll bar. The net result is an M5 that feels sharper and keener to drive than the regular car. Any hint of body roll has been ironed out and the steering, which was already sweet and predictable, feels even sharper to react to your inputs. Granted, there’s still not a lot of feedback through the absurdly fat steering wheel, but there is an accuracy here that is frustratingly absent from the E63’s rack. However, there are downsides to a more aggressive set-up – chiefly, an unsettled low speed ride. Around town small abrasions are felt through the base of your seat, while larger potholes and expansion joints jostle your passengers around. Ultimately, you have to decide if the firm ride is a worthy trade-off for such impressive high-speed composure. Then there are the optional carbon ceramic brakes (which are also available on the standard car). These are magnificently effective at stopping you from high speeds, but in town, when all you wanted was to roll up gently behind the car in front, they’re way too aggressive. The result is your passenger thinks you are a blithering idiot who can’t drive for toffee. But the most infuriating thing about both the M5 and the Competition are the endless modes and settings you have to fiddle with. Surely, if a proper sports car such as a Porsche 911 doesn’t require you to pull over for five minutes to set the car up for a mile or so of twisty road, then stop again for another five minutes to change everything back before joining a motorway, does the M5? We doubt it. Still, beyond all the gimmicks, this is still an almightily impressive saloon. In a straight line, it’s capable of eating supercars for breakfast while delivering you to your workplace unflustered – certainly less flustered than the more aggressive but arguably more exciting E63.